My first week at the University of Wisconsin, I was surrounded by the growl of moped engines. Like most freshmen, I began my day at a crowded 80 bus stop. I was on my way to Social Sciences, a hefty walk up Bascom Hill. It was ninety degrees out. For a fall day, it was miserable. Around me, students and faculty crowded onto the bus, faces pinched with worry. The bus driver could only let on thirty students, and we had a group of more than forty. The lucky chosen would enjoy air conditioning and a smooth ride up Observatory Drive — the rest of us would have to walk. On that day, my luck had run out. The 80 was crammed full with freshmen, and the driver waved us off. Behind me, an engine fired up. I turned to see a girl perched on a bright red moped, a backpack balanced on her seat. She sped past the departing bus, climbing up Observatory in mere seconds. In light of the difficulties of inter-campus travel, many — including myself — are drawn to mopeds. The small vehicles offer a convenient, low-cost method of travel. In Wisconsin, you don’t even need a motorcycle license to operate one. Recent legislation has designated harsher restrictions for moped parking, citing concerns over traffic and sidewalk congestion. The ordinance’s passage over the summer prompted outcry, with many citing lack of student involvement in the process. For parking purposes, mopeds would now be treated as motorcycles. Currently, mopeds can be parked for free on sidewalks and on some bicycle racks. 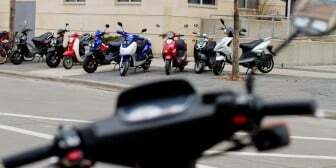 The legislation would require all mopeds to be parked within designated lots. Many students have said the restrictions would be a financial burden on those who choose to ride mopeds. 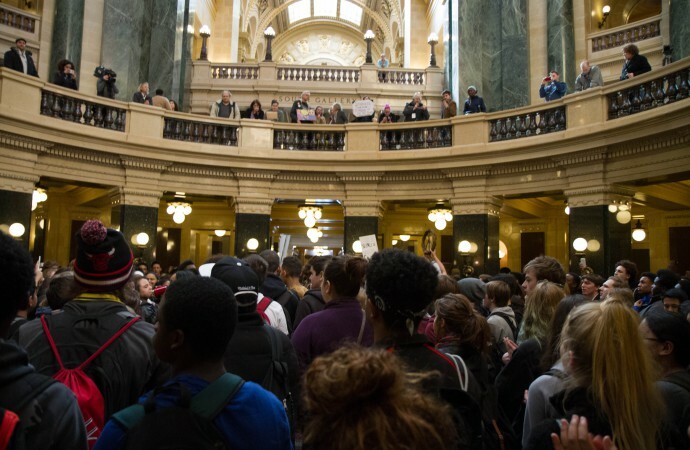 Some view the legislation as a direct attack on all moped usage at UW. But — if true — is the discouragement of mopeds really such a bad thing? Moped usage on campus has grown significantly over the past years. With this increase comes a list of problems, chief among them safety and congestion. 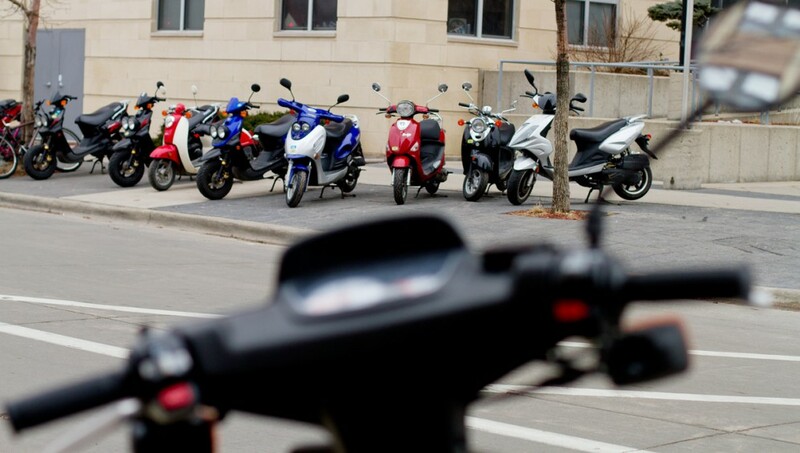 A slew of accidents in 2012 prompted legislators and UW transportation services to consider changes to moped usage, including restrictions on parking. Mopeds can only travel at approximately 30 mph, lending them a less dangerous reputation than motorcycles or cars. However, according to a 2011 UW Transportation Services report, they have more crashes than other motor vehicle operators. The state encourages all drivers to wear a helmet, and–unbeknownst to many–forbids the transportation of any passengers. Anyone walking down Park street can agree that these suggestions are rarely followed. Many students have voiced that the appearance synonymous with wearing a helmet is a main motivator behind why they choose not to wear one. There are anywhere from 30-40 moped accidents on campus every year. Moped safety drew some attention when UW wide receiver Kendric Pryor suffered facial injuries after a moped accident in early fall. Last year, two students were hospitalized after being hit by a car. A cursory Google search brings up headline after headline of grisly moped accidents, crashes, and injuries. A majority of the time, drivers (and their passengers) weren’t wearing helmets. A student crash in 2007 drew nationwide attention to the helmet “crisis” on campus. UW student Bill Schrack impaled his head on a metal spike after a moped crash, causing traumatic brain injuries that nearly took his life. The horrific accident was later shown in a since-deleted UW Police video encouraging helmet usage. But mopeds were never intended for inter-campus usage, officials said in the past. Increasingly, mopeds are being used for transportation between classes, instead of to and from campus — which leads to an increase in moped parking on university property. Many football players ride mopeds to practice before or after classes. Some students live far off campus, or have a long distance to travel in between lectures. For them, mopeds are essential to daily life. But, for the rest of us, this legislation prompts reflection. Moped accidents are becoming an increasing concern on campus, but we don’t seem inclined to acknowledge them. We forgo helmets, pick up an extra passenger, and speed up to our next class. Even indirectly, the discouragement of moped usage is an important step for Madison. Reducing accidents and increasing rider safety should be our priorities. It’s time to start treating mopeds as what they really are — vehicles with real, tangible consequences. So, potential buyers, beware. Give Bascom Hill a try, or pick up a free bus pass. Your classmates will thank you. Julia Brunson ([email protected]) is a sophomore majoring in history.